The HyperDrive covers all of the basics that we expect to see in a USB-C hub. It has a USB-C port, a USB-A port, MicroSD and SD Card slots, and most important of all for the 2018 iPad Pro, a headphone jack. I currently own two other USB-C docks and neither has this feature, making the HyperDrive a much better fit with the Pro. Another big difference between the HyperDrive and most other USB-C hubs is that it’s designed to securely dock to the iPad Pro. Both of my other hubs have small USB-C tethers permanently attached, neither of which is long enough to for the hub to rest on a desk while using the Pro in a case with a keyboard. 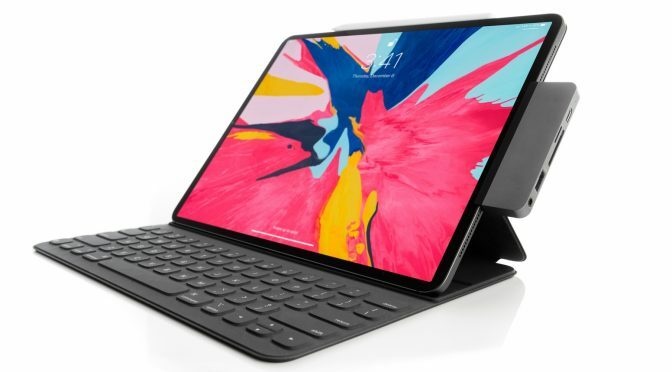 The HyperDrive may not be the most attractive looking hardware ever produced, but it sure beats having a heavy dongle dangling from the end of the iPad. This is especially true if you need to be able to move round with your iPad Pro with the hub attached. I jumped on the bandwagon last week and managed to get in before the wildly successful Kickstarter campaign for the HyperDrive wrapped up. However, never fear. There is still an Indiegogo campaign for the HyerDrive that you can get in on. And don’t worry. This company has shipped real, honest to goodness hardware before and both campaigns are fully funded. The HyperDrive is going to ship. According to the production schedule, earlier purchasers should be getting their HyperDrives soon. However, I’m sure it will be a few weeks before I get mine. When I do, you will be the first know.